The focus for this year was on the idea of ‘Breaking Point’ and how to potentially create a space which accommodates for an emotional upheaval in the dense urban context. Students were lead through a series of presentations by Adrian Carter, Brian Toyota and Leigh Shutter who provided us with valuable insight and inspiration towards our upcoming design process. As a group, our attention was also concentrated quite powerfully on the theme, being mental health. Rather than just keeping this as the theme for the design concept, the Upscale team managed to draw necessary attention to the nature of this issue in our industry. Dr Sue Jackson, a consulting psychologist was invited to speak about the issue and the necessity of a ‘safe place’ for every individual to retreat to in the pandemonium of our daily lives. We were lead through a short meditation which facilitated a state of being, rather than a state of doing. 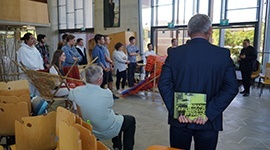 After the invaluable presentations, students were put into teams of 3 to design their structure before constructing it the next day at Bond University. An energetic and inspired energy filled the room as each young, aspiring architect would bounce off one another and fill rolls of butter paper with ambitious, thoughtful and beautiful designs and concepts. Refreshing snacks kept us going through the evening until 7 pm when lots of groups were forced to go home as we needed to be well rested for the next day of building. Tuesday morning met with a familiar excitement and readiness to get stuck into building. With 80’s bangers echoing through the workshop area at the back of the Abedian School of Architecture, student’s designs began to come together out of copious amounts of bamboo, string and zip ties. Each group’s design surprisingly different from the next, a sense of achievement and proud ownership fell upon each group of excited students. A grand lunch was provided for students, where Bond, Griffith and QUT students were able to mingle and compare degrees and university lifestyles. Moving inside, the forum of the school was filled with even more tacky but excellent music, tired students whose enthusiasm kept them dancing around their designs to finish up by 8pm. By Wednesday morning, all the well-rested students met back at Bond University for presentations, speeches and the announcement of the winners. Each design successfully translated the brief through innovative and engaging concepts, taking clever advantage of the challenging materials provided.